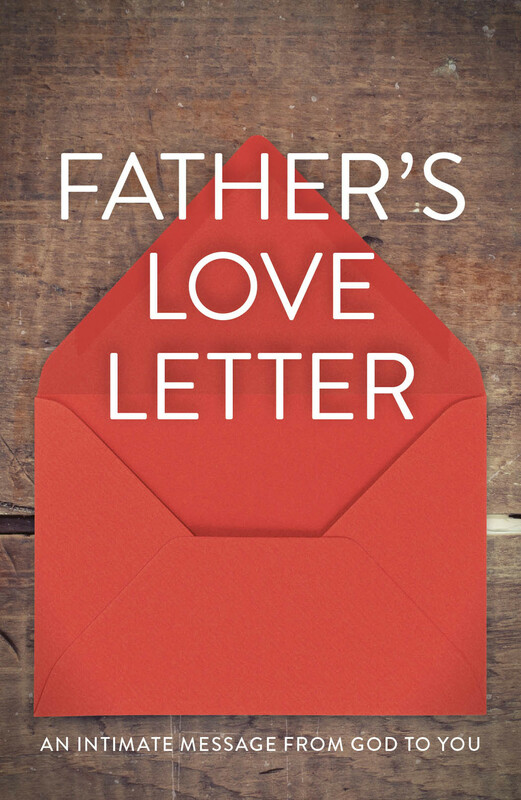 “Father’s Love Letter” combines uniquely joined verses from Scripture, in the format of a letter from the Father to his children, to articulate the gospel message. The words you’re about to read are true, and they will change your life if you let them. This letter comes from the heart of God to tell you that he loves you, and that he is the Father you’ve been looking for all your life. The promises God makes in these words from the Bible are directed to his children—those who have placed their trust in God’s Son, Jesus, as their Savior. And the good news is, you too can become a child of God! Be sure to read the last page of this pamphlet to find out more. You may not know me, but I know everything about you (Ps 139:1). I know when you sit down and when you rise up (Ps 139:2). I am familiar with all your ways (Ps 139:3)—even the very hairs on your head are numbered (Matt 10:29–31). You were made in my image (Gen 1:27). In me you live and move and have your being, for you are my offspring (Acts 17:28). I knew you even before you were conceived (Jer 1:4–5). I chose you when I planned creation (Eph 1:11–12). You were not a mistake, for all your days are written in my book (Ps 139:15–16). I determined the exact time of your birth and where you would live (Acts 17:26). You are fearfully and wonderfully made (Ps 139:14). I knit you together in your mother’s womb (Ps 139:13), and brought you forth on the day you were born (Ps 71:6). I have been misrepresented by those who don’t know me (John 8:41–44). I am not distant and angry, but am the complete expression of love (1 John 4:16). And it is my desire to lavish my love on you (1 John 3:1), simply because you are my child and I am your Father (1 John 3:1). I offer you more than your earthly father ever could (Matt 7:11), for I am the perfect Father (Matt 5:48). Every good gift that you receive comes from my hand (James 1:17), for I am your provider and I meet all your needs (Matt 6:31–33). My plan for your future has always been filled with hope (Jer 29:11), because I love you with an everlasting love (Jer 31:3). My thoughts toward you are as countless as the sand on the seashore (Ps 139:17–18), and I rejoice over you with singing (Zeph 3:17). I will never stop doing good to you (Jer 32:40), for you are my treasured possession (Ex 19:5). I desire to establish you with all my heart and all my soul (Jer 32:41), and I want to show you great and marvelous things (Jer 33:3). If you seek me with all your heart, you will find me (Deut 4:29); delight in me and I will give you the desires of your heart (Ps 37:4), for it is I who gave you those desires (Phil 2:13). I am able to do more for you than you could possibly imagine (Eph 3:20), for I am your greatest encourager (2 Thess 2:16–17). I am also the Father who comforts you in all your troubles (2 Cor 1:3–4). When you are brokenhearted, I am close to you (Ps 34:18); as a shepherd carries a lamb, I have carried you close to my heart (Isa 40:11). One day I will wipe away every tear from your eyes, and I will take away all the pain you have suffered on this earth (Rev 21:3–4). I am your Father, and I love you even as I love my son, Jesus (John 17:23). In him, my love for you is revealed (John 17:26). He is the exact representation of my being (Heb 1:3). He came to demonstrate that I am for you, not against you (Rom 8:31), and to tell you that I am not counting your sins against you (2 Cor 5:18–19). Jesus died so that you and I could be reconciled (2 Cor 5:18–19). His death was the ultimate expression of my love for you (1 John 4:10): I gave up everything I loved that I might gain your love (Rom 8:31–32). If you receive the gift of my son, Jesus, you receive me (1 John 2:23), and nothing will ever separate you from my love again (Rom 8:38–39). Come home and I’ll throw the biggest party heaven has ever seen (Luke 15:7). I have always been Father and will always be Father (Eph 3:14–15). My question is: will you be my child (John 1:12–13)? I am waiting for you (Luke 15:11–32). FINDING OUR WAY HOME. We were born cut-off from God because of our sin (Isaiah 59:2), but God the Father made a way for us to come home through his Son. Jesus bore upon himself the weight of our sin, nailing it to the cross so that we could be born into his family (Romans 5:10). WILL YOU RECEIVE HIS GIFT? Tell God that you trust in his Son. The words below can help you express your thoughts to God. "Father, I know I can’t save myself, and I know you’ve promised to save those who repent and put their faith in Jesus alone. I trust you to forgive my sins so that I may receive eternal life. Thank you for sending your Son to die in my place and make my salvation possible."